Hard water and iron-rich water are generally only noticed by people when they use their well water for drinking, bathing, or cleaning. Hard water won’t make the bubbly suds it should, which can be really annoying. Copper- and iron-rich well water may smell or taste strange. Besides the aesthetic concerns, both hard water and iron-heavy water can cause damage to your home that you often won’t notice until it’s too late. If you have any of the issues listed below, you need water treatment in the form of water softening, filtration, or injection systems to clear water of minerals and other deposits. If your well water has high levels of calcium, lime, and other minerals, a crystalline or salty looking crust develops on your shower head and faucet openings. Over time, this scale or crust reduces shower flow. Mineral deposits from hard water can also form on shower door frames, causing sliding doors to stick and the shower area to look unsightly. Dripping water may cause calcium deposits to form on drains and other fixtures. This annoying problem means your showers take longer, your shower head looks nasty, and your fixtures can be damaged by the crusty deposits. As an added gross bonus, bacteria easily grows in the nooks and crannies of the thick deposits. If you open your toilet tank and see a lot of rust-colored, slippery growths inside of it, chances are good that you have iron oxidizing bacteria in your well water. The bacteria and slime often give off a tell-tale odor that some describe as musky or oily. Iron oxidizing bacteria are unsightly, hungry germs that don’t harm humans, but they do present problems to pipes, pumps, and fixtures. Iron oxidizing bacteria, also called Gallionella, are non-coliform germs that do what their name describes: take iron and other minerals and oxidize them. The bacteria create a slime to help the rusty growths attach to the sides of well casings, pipes, and toilet tanks. If your well system does have iron oxidizing bacteria in the water, you face many potential plumbing issues. Over time, the slime and growths cause serious corrosion of pipes and fittings. Filters, screens, and valves become coated in the slime and fail to work properly. 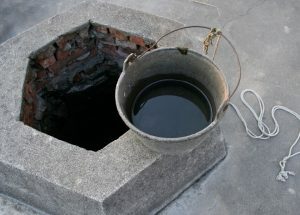 The oxidized iron can also cause your water treatment system to fail, or worse, shut down your entire well pump. Water tainted with a heavy load of copper often has a slightly blue-tinged appearance. Heavy copper deposits in well water are often noticed first by people with blond hair. Over time, heavy copper deposits turn blond hair green. Those blue-green streaks in your tub and toilet are additional telltale signs of heavy copper deposits in your water. In most cases, the home’s copper pipes are the cause of the leaching copper, especially in a new home. In an older plumbing system, a film has formed over the copper to keep it from leaching into the home water system. Other times, nearby industrial causes or heavy copper deposits in the soil are the issue. Aside from being unsightly, heavy copper concentrations in the water can cause health problems, especially for children under one year of age. The excess copper can also lead to corrosion of pipes and other problems with your plumbing. In some cases, a low pH level of the water system exacerbates a copper problem. Have your well water tested by professionals to determine the levels of minerals and other dissolved solids in the water. Your water treatment company will also test the pH of the water to determine if it’s too low or high for system safety. Excess calcium and magnesium deposits are generally handled with a water softening system. Once your water softener has these minerals under control, you won’t see those scale deposits on the shower head and faucets. Eliminate iron oxidizing bacteria with a thorough cleaning of your pipes and system. The treatment must penetrate the slime as well as the deposits. If pipelines from the well itself are clogged more than 20 percent by the iron bacteria, they should be cleaned. A filtration system or other treatment option can be used to eliminate excess iron from the water as well. Copper contamination of well water from outside sources can be dealt with by first identifying the amount of copper in the system. Next, the pH of the water must be tested. Filters and pH adjustments are some remedies that may work. Homeowners should also use point-of-use filters, including countertop water filters if they have heavy copper contamination from outside causes. Trust the experts at Johnson Water Conditioning to perform a thorough analysis of your well water system. We offer an array of water treatment solutions including water softeners, reverse osmosis systems, iron filtration units, and several types of injection systems.